Whatever you name it, and however you pronounce it, there is simply no other dessert quite as satisfying nor as versatile as the humble rice pudding. Just about every nation on Earth has a variation incorporating local preferences and flavours such as cinnamon quills, lemon peel, alcohols, preserved fruits and even vegetable gums. My first experience preparing rice pudding was at cooking school, where we were taught that moderate heat, patient stirring and maybe a dash of liquor toward the end will reward you with the creamiest, tastiest result. The memory of my first spoonful of that just tender rice, topped with a perfectly spiced poached pear has solidified it in my mind as a true favourite. Fast forward to a more recent time, and rather serendipitously there came about a chance to prepare this recipe again with some of our friends in Canberra. For the occasion, we borrowed the whimsical and talented Lean Timms, whose credit belongs to the photos in this post, as the photographer and stylist of the day. Kerist of Shop Girl Flower Girl generously lent use of her home for us, while Jasmin and Kate took part in preparing and enjoying the dessert. 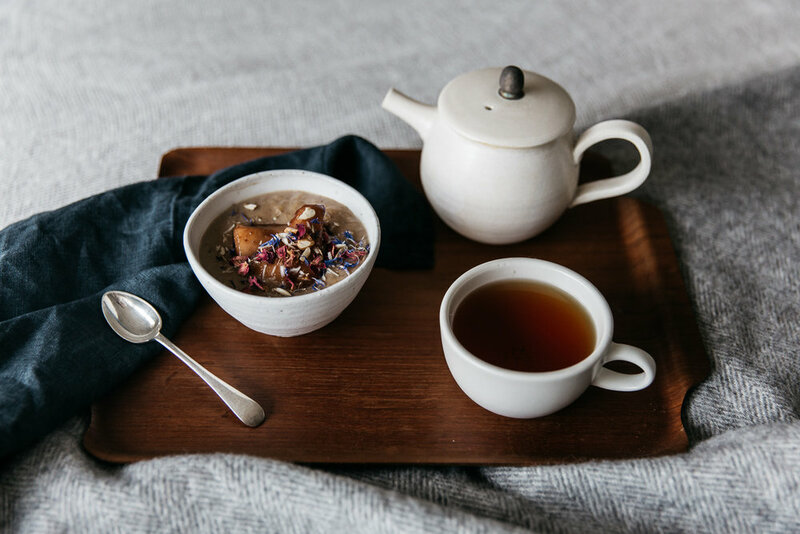 This recipe is inspired by the classic French favourite that I learned many years ago, featuring short grain rice simmered to tenderness in a crème of our delicately fragranced loose leaf Earl Grey, milk, sugar and whole vanilla bean. The warm pudding is topped with a succulent Masala Chai spiced poached pear and garnished with vibrant cornflower and rose petals. The result is a wonderful dessert that fuses fine tea with a delicate dessert. Add in a splash of milk prior to serving as a warm dessert to achieve a creamy consistency, or distribute into serving bowls and chill for 2-3 hours for a cold dessert that is perfect for summer entertaining. Bring milk to the boil. Remove from heat and add in the Earl Grey and vanilla bean. Infuse for 10-15 minutes. Strain. Re-boil milk and rain in the rice. Reduce to moderate heat and stir constantly until rice is tender. Fold in the sugar and allow to cool. Adjust consistency with remaining milk. Serve with poached pear as a garnish. Peel the pears and remove the core. Cut into quarters. Bring liquid to the boil and reduce to low heat. Add in the pears and cook until just tender — the tip of a knife should be able to cut through with slight resistance. Remove pears from liquid. Reduce liquid to half volume and remove from heat. Allow to cool slightly. Add in the pears again and carefully coat in the sugar syrup. Remove and serve.